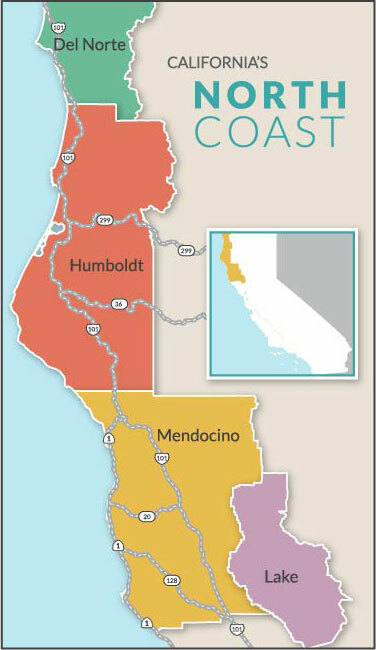 Mendocino County, Humboldt County, Lake County and Del Norte County make up The North Coast Region. Here you'll find California's favorite Wine, Waves, Wilderness & Woof destinations. Relaxation is the name of the game, and your dog is welcome almost anywhere. Mendocino County is dog heaven, one of the most dog-friendly regions in California, and one of California's largest and most climatically diverse wine growing regions. Mendocino is one of the leading wine growing regions for organically produced wine grapes. The wines of Lake County are influenced by Clear Lake, the largest inland body of water in the state. Cabernet Sauvignon is the most planted varietal. Middletown Trailside Nature Preserve County Park and Boggs Mountain Demonstration State Forest have popular dog-friendly trails. Whether your inclinations run toward renting a vacation home at popular Clear Lake or cozying up for a weekend at a bed-and-breakfast inn overlooking the Pacific, you’ll find plenty of dog-friendly lodging and activities to suit your needs.